After a long trek through the wilderness and the horrors of the battlefields of the Mournlands, the adventurers finally arrived at Whitehaven Mine. 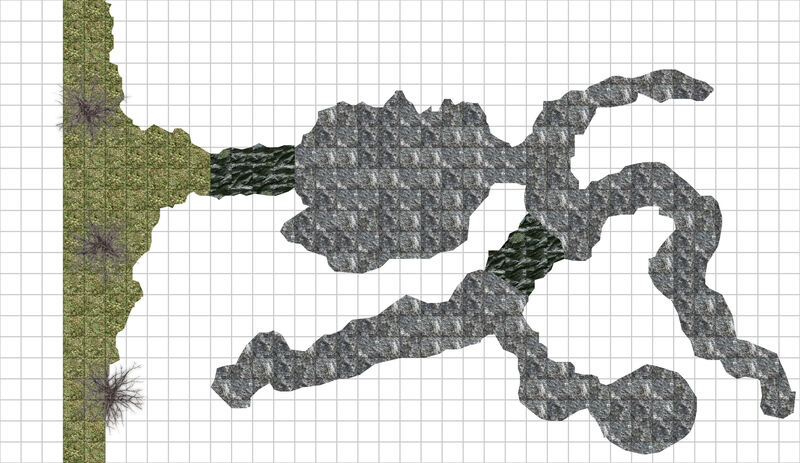 The area to the left is open terrain, the darker sections are ramps heading down, the rest are caverns. These long-abandoned tunnels had concealed a House Cannith research laboratory before and during the Last War, and had been overtaken and lost during the magical cataclysm that created the Mournlands. Now, as they investigated, they found a number of hatches at the end of each tunnel. All but one of them were false entrances, trapped with electrical discharges. The correct hatch was opened with a key provided by their benefactor, and led to a set of rungs descending into the deeps. These led to the Whitehearth Facility. On their return from the laboratory, the group found Emerald Claw troops with undead support, led by a necromancer and what appeared to be a vampire. An offer to surrender their treasures was met with an open assault, leading to the Emerald Claw troops being routed.